Trailer for Hurry Up Bob!, available on the iOS App Store. Get it now! Hurry Up Bob! 2 was recently released on the App Store. Download it now! Hurry Up Bob! Was updated to fix several bugs and add some new visual effects. Be sure to get the latest version. 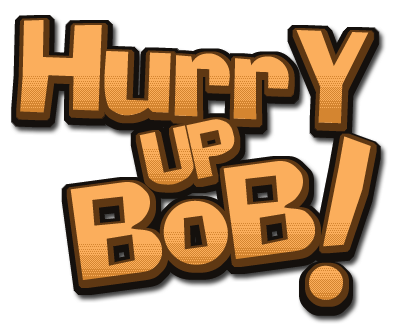 Additionally, we now have Pro versions of both Hurry Up Bob! and Hurry Up Bob! 2. These versions cost $0.99USD and include all game features without the need for an in-app purchase. Hurry Up Bob! Was approved on Wednesday, June 15, 2011 and is now available on the App Store! Hurry Up Bob! Was submitted to the App Store on Wednesday, June 8, 2011 and is now waiting for review. Coming soon! Obnoxius v1.1, featuring Game Center integration, improved menus, and more!